On first connecting to an EQuIS database, EnviroInsite queries the database to determine the contents of the stored analyte groups and automatically converts the analyte groups into EnviroInsite constituent groups. EnviroInsite refers to the analyte groups using the value of RT_MTH_ANL_GROUP.METHOD_ANALYTE_GROUP_DESC. Saved EnviroInsite documents contain the defined constituent groups. While EnviroInsite constituent groups may be changed, these changes will be overwritten by the contents of the EQuIS analyte group if the document is saved and then later restored in EnviroInsite. On restoration of an EnviroInsite session, the contents of the constituent group will be updated if there have been any changes to the analyte group in the connected EQuIS database. Changes to the constituent groups in EnviroInsite are not conveyed back to the EQuIS database. A layer using a constituent group will not automatically update with any constituent group changes, but must have its properties manually edited to reflect these changes. To prevent constituent groups from being associated with layers, the constituent group can be used to add multiple analytes but then removed from the Constituent Group property by clearing it. Analyte groups are defined in the RT_MTH_ANL_GROUP and RT_MTH_ANL_GROUP_MEMBER tables. When EnviroInsite looks for analytes within the analyte groups, it only selects those for which the RT_MTH_ANL_GROUP_MEMBER.TOTAL_OR_DISSOLVED and RT_MTH_ANL_GROUP_MEMBER.MATRIX FIELDS are populated. If either are not populated, the analyte will not appear as a member of the constituent groups in EnviroInsite. 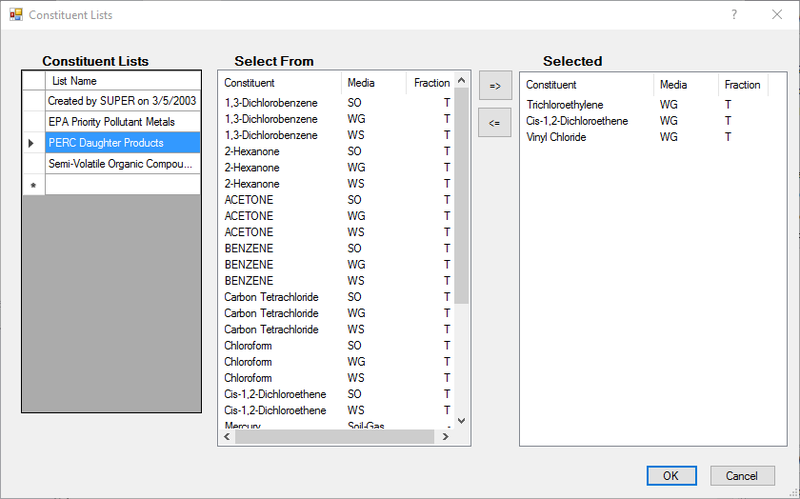 If none of the analytes in a particular analyte group have populated both of these fields, the entire analyte group will be unavailable for selection in EnviroInsite. Constituent groups may be examined in EnviroInsite by selecting Edit> Groups> Constituents from the main menu. See Constituent Groups for more detailed information on adding, editing, or removing constituent groups.